number: 56475600545188 with Serial number 5368/02 drew the lucky numbers:  04 . 07 . 26 . 28 . 39 . 49 . 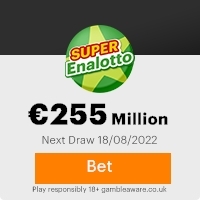 Bonus Ball  which subsequently won you the lottery in  the 1st  category i.e match  6.
and Fifty Thousand, pounds sterling) in cash credited to fil XYC /26500460037/08. with part of your prize awards, you will take part in our subsequent lottery jackpots. this email, if you have benefited from this donation in previous years. Hundred and Fifty Thousand, pounds sterling) will be released to you by our payment office in UK. This Email with the Subject "Attn: Ref: XYC /26500460037/08" was received in one of Scamdex's honeypot email accounts on Tue, 20 Feb 2007 09:54:26 -0800 and has been classified as a Generic Scam Email. The sender shows as LOTTERY BOARD <webonline1@bellsouth.net>, although that address was probably spoofed. We recommend that you do not attempt to contact any persons or organizations referenced in this email, as you may expose yourself to scammers and, at the very least, you will be added to their email address lists for spam purposes.